I love kitchen gadgets. Everything from an immersion blender to an infrared temperature gun have found their way into my home. But if something is going to take up permanent real estate in my kitchen, it needs to be useful. And if I am going to spend money on it, it needs to be better than something I already own. The best kitchen tools are useful, better than alternatives, and make my life easier. Recently I installed a new kitchen faucet that was all of those things. I replaced my standard faucet with the Moen Arbor with MotionSense. It is easy to fall in love with the idea of this faucet. MotionSense allows you to turn the faucet on without even touching it. The Ready Sensor is activated anytime you put your hands or an object like a cup or pot in front of the sensor. You can wash your hands, rinse out a bowl, or fill a glass with water without touching the handle. Whatever is on your hands--cookie dough batter, raw chicken, or mud--stays away from your faucet and is easily washed away. No dirty faucet and no spreading of germs. As soon as you remove your hands from under the faucet, it automatically turns itself off. The Wave Sensor turns the faucet on when you wave your hand over the sensor located on top of the faucet. One wave turns it on and you can fill a pot for cooking or the sink for washing dishes. The water will continue to run until you wave your hand over the top of the faucet again to turn it off. Again, no touching the handle required. I was excited to see if these features would be as handy in practice as they appeared in the Moen videos. I was impressed with how easy the Moen Arbor with MotionSense was to install. With all of the features, I assumed there would be a lot more to the installation than that of a standard faucet. There are a few more steps, but Moen has made the installation literally a snap with their push-fit connections. And all of the tools you need, including supply lines, are included. Once it was installed, we set to work giving it a thorough test run. I think my children may have washed their hands more in that one day than they usually do in an entire week. Because you set the temperature for the Ready Sensor and the Wave Sensor on the control box, I never had to worry about my younger kids turning the water on too hot and burning themselves. I also didn't have to worry about them not turning the water off completely, since it was done automatically. I didn't have to wipe down the handle with disinfecting wipes, something I have been trying to be diligent about with a two-month-old in the house. I also didn't have to wash off any of the mud, paint, and fingerprints that usually accumulate on my faucet with four kids in the house. I am keeping my fingers crossed that Moen comes out with a MotionSense faucet for the bathroom! At dinnertime the love affair with this faucet continued. The Ready Sensor made it quicker and easier to wash fruits and vegetables and to fill and rinse pots and dishes, and not having to touch the handle reduced the chance of any cross-contamination. It also saved water because the faucet immediately shuts off when I move my hands out from under it. All of this made my time in the kitchen much easier, especially since I spend a lot of my time trying to do things one-handed while holding a newborn. Before installation, I was worried about the faucet coming on when I didn't want it to, like when I was wiping down the sink and counters around the faucet, but Moen took care of that too. Holding your open hand over the Wave Sensor for five seconds disables the sensors. I could wipe down the kitchen faucet without unintentionally turning the water on. When I finished, the sensors are turned back on in the same way, in just five seconds. 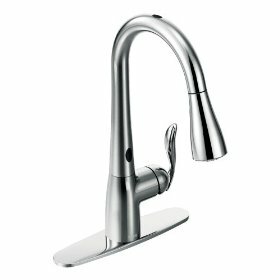 The Moen Arbor with MotionSense faucet definitely fit all three of my criteria: It was useful, better than my previous standard faucet, and made my routines in the kitchen--especially with a new baby--easier. If you're interested, you can learn more about the product features and where to purchase the Moen Arbor with MotionSense by clicking here. I would love to hear how the Moen Arbor with MotionSense faucet would make your time in the kitchen more convenient. Leave me a comment letting me know what feature would help you out in the kitchen and you will be entered to win a $100 Visa gift card. I love that you don't have to touch the handle! My handle gets so gross! That is my next kitchen faucet! Awesome giveaway-thank you so much! No need to touch the handle-so much time would be saved cleaning it-sounds wonderful! Awesome! Would love not touching the hadle when cooking. It gets so gross. I just saw this faucet at Home Depot the other day! What an awesome idea. Love it! I love that you don't have to touch the handle to turn on the water... this would really help out my little ones who aren't tall enough to reach the handle to turn on! What a great way not to have to touch handles during the flu season or if someone in the house is not feeling well. Also when cooking with poultry the germs do not get on the faucet handles. The Ready Sensor would be helpful in keeping my kitchen clean and safe. I won't have to worry about cooking with meats or eggs and accidentally contaminating the sink handle. I'm a total germaphobe & I'm in love with the sensor! My kids are forgetful and I also appreciate how it turns itself off. Awesome! I would love that- with my three independent yet young kiddos, ourwater faucet always gets left on! This would be sooo useful! Thanks for the in depth review. This faucet would be so handy to have in the kitchen for those times when I'm cooking and my hands get dirty. It would be great to be able to use the faucet without having to touch it with my dirty hands. Thanks for the chance to win! When I have my hands icky while cooking, I don't have to touch a handle and spread germs. Wonderful! The automatic turn on/shut off feature would be great. It would help save water and not having to touch the handles would be nice. I love how you don't have to touch it. Thanks for the chance to enter. It would keep things so much more sanitary!!! Anything that saves times with having three children is awesome. I just got back from traveling and used motion sensor faucets almost everywhere. I have very bad arthrtis in my hands and a faucet like this would be so great. I struggle to turn the faucet on/off. So, so need a new faucet! This would be so awesome! My faucet handles are always smudged and dirty, and I clean them obsessively because I don't want to spread germs. The germaphobe in me would LOVE this. Thanks for the giveaway! I think the motion sensor is obviously the best feature. When I'm cooking I'm constantly being interrupted by my little one, washing my hands, helping, him out, then washing my hands before I start touching food again. This would be just wonderful especially when I am handling meat. I hate fumbling with the faucet trying to turn it on with my wrist and turn it back off during my multiple trips to the sink. We also just bought a house and were impressed by these faucets when we were browsing around Home Depot this past weekend. What a wonderful prize. This would be so wonderful t have in any kitchen. Wow it would save so much water while rinsing off the dishes to load into the dishwasher. We have a hot water boiler in the basement that runs our heater. Because of that (and because we haven't gotten around to it) we can easily burn our hands because we can't lower the temperature in the basement. I would love to be able to control the temperature so I can't burn myself, or my kids. That faucet is so cool! How handy! I love it the most for kids. I can figure out how to turn on my faucet without getting it gross but whatever is on their little hands always ends up on the handle. no greasy dirty hands all over the faucet!! This would be so great with my 5 year and 3 year old boys. They always get the faucet so dirty! I like that you don't have to touch the handle to turn on the water. Love the idea of not having to touch the faucet! With cold & flu season, I'm always reminding my kids to wash their hands and afterwards, I wipe down the faucet. This faucet would save me time without having to wipe the faucet down. I love that you don't have to touch it to turn it on. I hate trying to contort my hand to use my wrist to turn on the water when I have raw meat hands! Looks like a great faucet! I love that there's a wave sensor. cool! The wave sensor feature would save me from touching the faucet with messy hands from cooking. I would love that! Not having to touch the handle with messy hands would be awesome! With a baby in my arms I often only have one hand free. What a lifesaver this gadget would be! Moen Arbor with MotionSense faucet would make my time in the kitchen more convenient! I make bread all the time and my hands could be messy after kneading the dough. The waving senser over the faucet would help me out in the kitchen bit time to keep things clean! I'm getting ready to have a baby, so not having to touch my faucet could certainly make things easier, especially when there's spit up involved! Ready Sensor - wow! How perfect with kids and multi-tasking duties! A tired mom can dream, no? It would be great saving you the step of touching the handle to turn it on when your hands are already dirty or sticky with food. The wave sensor. I love this feature because when I am handling raw chicken, the last thing I wan to do is touch the faucet to wash my hands because then I have to wash that as well. I like the The Wave Sensor feature. This will make life easier by not having to worry about spreading bacteria with my hands after touching meat or other things. my favorite feature would have to be the The Wave Sensor! so awesome! That would come in very handy when the Hubby is painting and has paint on his hands! The best feature is that you don't have to touch the handle! No more paint on the handle! I've been saying for years that "No Touch" soap is ridiculous & that a "No Touch" faucet would be more practical to cut down on food borne disease! This would make any kitchen (mine included) cleaner. I love the no touch handle. This would be perfect for my house especially with germs, etc... Like right now I have a cold and wouldn't have to touch any handles. What's not to like about it! I would love being able to wash my hands while i'm cooking without messing up the faucet! This feature is so neat - The Wave Sensor. I love that you don't have to touch the handle! Perfect for this crazy flu season! Motion sense faucet in the kitchen- my dream comes true- no more touch handles using my busy hands while cooking. I love hand free faucets, so i don't feel like I'm making the faucet dirty all the time, it would save water too. thanks for the review and giveaway. Kids wash more because it is cool, no hands!! OH! This would look great in my soon to be remodeled sometime this year kitchen that I can visualize in my head! The no touch would be great after handling raw meats. I love the hands free and temperature control! i wouldn’t have to have hubby come turn the water on when i need to wash my hands after handling raw meat, cool! This would be great to wash my hands after I have been working outside. Man. I'd love to have a faucet that is hands free because my hands are always full! Not having to touch the handle would save water and stop the spreading of germs. The feature that would help me out in the kitchen is not having to ouch the handle to turn it on. Like you, i feel like I am constantly wiping the handle clean. This would really reduce the necessity to do that so often! This would help simplify my life by making it easier to wash my hands and my daughter's hands that always seem to be sticky! I so need a new faucet. I think Moen is a top of the line faucet and the MotionSense faucet would make clean up in my home 100% better. Not having to touch the handle with dirty hands? That would be AWESOME!!! I like that I don't have to touch the handle, so that germs are spread so easily! My husband and I were having a conversation the other day about our kitchen faucet and how it needs to be replaced. I LOVE how you don't have to touch the handle...I am way OCD about getting germs on the kitchen faucet especially after handling raw chicken or any kind of meat. THANKS! Brilliant! I've never been able to figure out how to wash my hands when they're covered in raw chicken. Yuck! Would love this! We have Moen faucets but are getting ready to put in a new shower so the win would help out a great deal! i love the auto-water-turnoff. That would help with the flow of what I'm doing. That faucet looks wonderful and having a hands free faucet would have come in handy! I do a lot of baking and that means always having messy hands. I've seen the commercials for this faucet and love it - much more sanitary than touching knobs with gross hands. This would be awesome to have cause I have 3 lil ones in te house.. I love th eno touch feature. This would simplify my life because it would save water by turning off automatically and also I wouldn’t get the faucet dirty since I wouldn’t need to touch it with my dirty hands! This would make life in the kitchen faster, easier and cleaner. It would be great for washing my hands after touch raw meat. Hubby is getting artritis, so not having to bend over a sink and twisting his wrist is a major help to me, I worry less about his pain. Hands free AND saves water - what's not to love? Sometimes hands are sticky from food preparation and not having to touch the faucet will keep it clean. The cat could self water. The wave sensor is my favorite feature, it would help out so much when my hands are dirty from cooking! I love the wave sensor feature. I would love to win this for my niece. She has an incurable debilitating muscle disease affecting approximately only 1 in 25 million adults. Performing tasks of any kind in the kitchen is very challenging for her. This would certainly help her as her grip strength is waning. Gotta do my dishes by hand, this would be a fantastric additioh! What a cool faucet! I get so worried about germs on the faucet when I'm dealing with raw chicken. The best thing would definitely be the touch sensor--great for times when hands are really dirty and you don't want to touch ANYTHING! I love the touch sensor. So much more sanitary! I am an avid cook and it would be great to not have to risk cross contamination while preparing my meals by turning on the faucet with the "no touch" feature. This faucet is so neat, You can hold a big pot or other things and turn on the faucet? I would love to have a faucet in the kitchen that comes on without touching. My hands can get pretty messy, and the faucet handle gets messy, too. This faucet is great in so many ways. I'm a messy cook so my hands always seem to be covered with something so it would really keep the faucet clean. And the ease of filling my stock pot without having to touch the faucet is awesome. I need a change to my sink and faucet. This would be great! Less mess & germs makes things a lot easier. This would be so great not to have my hands covered with food and then have to turn on the faucet. So much healthier. I hate having to turn the handle on while trying not to touch it. The fact that this is automatic would be amazing. this faucet would make my life easier by allowing me to conserve water and also by letting me cook with more efficiency and clean up a whole lot easier. I love this, such a simple solution to messy cooking! I like the hands free feature which would be perfect for my disabled daughter. being able to move quicker in the kitchen by not turning handles is a greeat feature! I an fanatical about handwashing while preparing food so the Moen Arbor with MotionSense would make it so much easier and much more sanitary than touching the faucet. I'd love one!